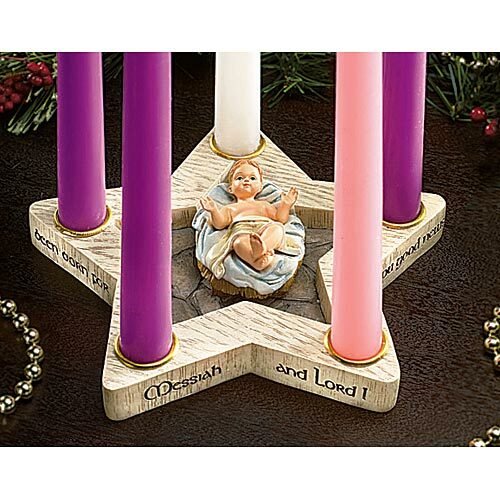 The Star-Shaped Advent Wreath holds 5 candles, your four Advent tapers, and one white Christ candle. Luke 2:10-11 I proclaim to you good news of great joy that will be for all the people. For today in the city of David a savior has been born for you who is Messiah and Lord. is written around the outside of the star, and the baby Jesus is removable, so you can place him in his manger on Christmas Eve. Advent is about preparing. Preparing for Christmas. Preparing to celebrate the birth of our Savior. Beginning four weeks prior to Christmas a candle is lit each Sunday reminding us of Jesus' arrival in Bethlehem so long ago. Week by week another candle is lit until finally all are illuminated in celebration of the coming of the Light of the World.